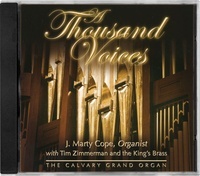 This CD features J. Marty Cope on one of the world’s largest pipe organs, performing arrangements of hymns and other sacred music. Accompanied by Tim Zimmerman and the King’s Brass, this recording is excellent for private and family worship. Audio: O That I Had a Thousand Voices, "Energico"
Audio: O That I Had a Thousand Voices, "Allegretto"
Audio: Prelude on "Beach Spring"
If you even have a mild appreciation for organ music, you may surprise yourself slipping into your choir voice while listening to this CD. J. Marty's style is refreshing and energetic. And you'll be hard pressed to find something comparable to the King's Brass playing alongside the organ. This is not one of those CDs you buy for that one special track. Each hymn is interpreted in its own unique style, giving the entire CD a touch of heavenly glory you'll want to hear over and over as though it were your first time.